Sexual selection is a powerful evolutionary driver. It describes the reproductive advantage that attractive individuals have over their less desirable conspecifics, and is responsible for some of the most spectacular traits seen in nature. In most organisms males compete for the attention of females, and although the traits that females find attractive vary greatly between species, they all have one thing in common: they provide an honest indicator of a male’s quality. As a result, females gain an advantage from mating with these attractive males - either direct benefits such as increased parental care, or indirect genetic benefits for her offspring. These sexual signals are finely attuned to the environmental conditions in which they have evolved, meaning they are particularly sensitive to anthropogenic, environmental change. It has been well documented that changes to the physical or acoustic environment can interfere with these sexual signals, but very little is known about the impact of altering the chemical environment. This is surprising given the prevalence of chemical pollutants in ecosystems, and the pivotal role chemical communication plays in the reproduction of a wide range of species. Endocrine disrupting chemicals (EDCs) are a broad group of chemical pollutants with the potential to disrupt the mechanisms of sexual selection. One EDC of particular concern is trenbolone - a potent anabolic steroid used globally as a growth promoter in the cattle industry. Trenbolone has been detected in several waterways associated with cattle feedlots, and is known to cause severe morphological and physiological abnormalities in fish. However, its behavioural impacts are poorly understood, particularly its impact on sexual selection. To address this knowledge gap, we investigated the impact of an environmentally relevant concentration of trenbolone on sexual selection in the guppy, Poecilia reticulata. 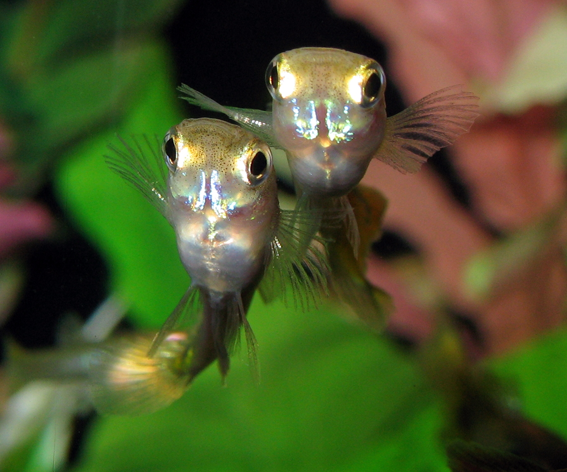 Guppies are an ideal candidate for this kind of research as females are choosy, exercising mate choice based on a range of male traits. We found that when given a choice between a trenbolone-exposed and an unexposed male, unexposed females showed a clear preference for the unexposed male. However, when exposed females were given this same choice, they stopped being choosy, showing no preference for either male. Considering female mate choice plays a pivotal role in determining the number and the quality of offspring produced, this decreased choosiness could have a severe impact on population dynamics and broader evolutionary processes. Contributed by Patrick Tomkins, PhD candidate at Monash University, Melbourne.